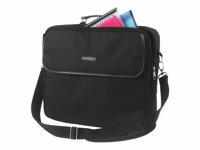 A classic yet functional laptop case, the Kensington SP30 Case, has a storage space for all your important items. The padded laptop compartment protects your laptop while the front flap pocket offers quick access to the items you need most. It even attaches to your roller bag for easy airport travel.